Eight years ago, Coulton invited his fans to join him on a cruise ship. His idea was to have a week-long floating "summer camp" for geeks, with lots of tabletop gaming, cosplaying, music, comedy, comic books, science fiction readings, panels, presentations, and workshops. About 375 "Sea Monkeys" took him up on his offer. 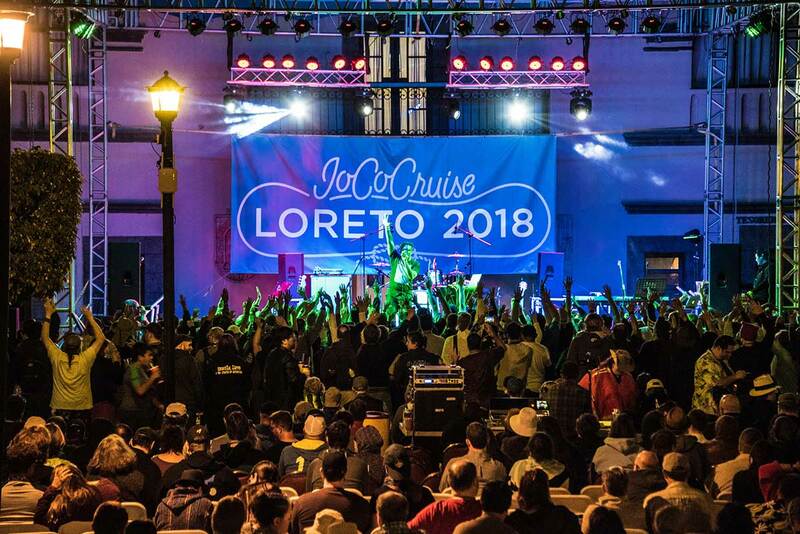 It turned out to be something people loved, and so the “JoCo Cruise” became an annual event. I was invited this year as a performer (doing talks, panels, and workshops), joining 1,600 other Sea Monkeys to take over an entire cruise ship (Holland America's ms Oosterdam) for a trip from San Diego to Baja California, Mexico. It was the eighth JoCo Cruise, and Carla and my daughter Jane came with me. This was the second cruise in my life. I’d taken one with Carla about 25 years ago. It was on a Carnival Cruise ship, a cruise line that David Foster Wallace describes in A Supposedly Fun Thing I'll Never Do Again as the “Wal-Mart of the cruise industry, which the other lines refer to sometimes as ‘Carnivore.’” I didn’t have a great time on that earlier cruise, so I wasn’t looking especially forward to the living-on-a-boat-and-eating-crappy-food part of the trip, but as soon as we boarded the ms Oosterdam in the Port of San Diego I realized this was going to be a lot better than the Carnival Cruise. For starters, the boat was gorgeous and clean and the food was excellent. There was a poolside taco bar that I visited frequently, several restaurants, lots of cozy nooks to hang out, and a buffet that was open until late at night. There was also 24-hour-room service at no extra charge. I ate my way from one side of the ship to the other, gaining five pounds over the week. Also, this cruise was a full-ship charter - Sea Monkeys only. As JoCo says, having the entire ship means not "having to juggle and fit our programming around the rest of the passengers and their schedule. Because we are the rest of the passengers!" That made all the difference in the world. The thing that really made the cruise unique, though, was the passengers. I could relate to everyone! (JoCo describes the passengers as "technophiles, tabletop gamers, and creative-minded people of all stripes." Sounds right to me.) A lot of the people told me they've been reading Boing Boing since it was a print zine. A couple of people even said they have the first issue, which came out in 1988! Everyone was interesting. Some dressed in fancy costumes. Many carried ukuleles. There were 10-year-olds and 70-year-olds. I felt comfortable around these people and temporarily transformed from being a full-on introvert into a semi-introvert! I spent a lot of time on the 10th level of the boat in the Explorer’s Lounge – ordering espressos, playing Zelda: Breath of the Wild on the Nintendo Switch Carla gave me for Valentine’s Day, reading an advance copy of Gary Lachman's scary and fascinating book, Dark Star Rising: Magick and Power in the Age of Trump, and staring out the wall-to-wall, floor-to-ceiling windows at the endless ocean. It's hard to convey how wonderful this cruise really was. Carla, Jane, and I didn't want it to end. We want to do it again next year! JoCo Cruise 2019 will be in the Caribbean. It sails March 9-16 from Ft. Lauderdale Florida, and the ports of call are Half Moon Cay, San Juan, and Tortola. The special guests are They Might Be Giants! If you register for JoCo 2019, tell them I sent you! Randy had a Boing Boing Coop shirt! We were the last people off the ship! We spent all morning in the Explorer's Lounge.